These had been a worry for a while… Rather than being a fabrication they were spheroidal cast iron castings. The “rod” bit needed turning down to a 3/4 inch diameter over a length of about 8 inches, and I was worried that given the age of the Harrison lathe I would have trouble getting them parallel to within the 1 thou I thought would be needed (no tolerances on the drawings, but this seemed right.). 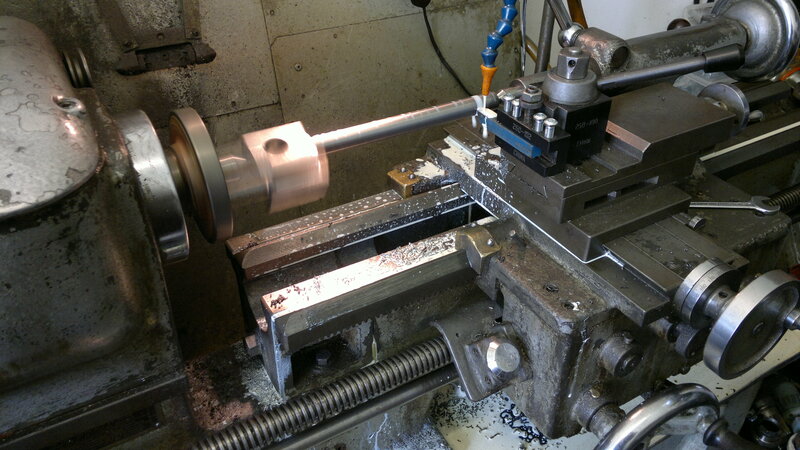 The clear plan was to turn the rod bit between centers, then hold this in v-blocks to machine the cross-head and little end bearings. So the first thing was to get the ends flat to allow them to be centered. I had been waiting for a job like this, as the shaper table has a nice v-slot machined in the right hand side for exactly this purpose. 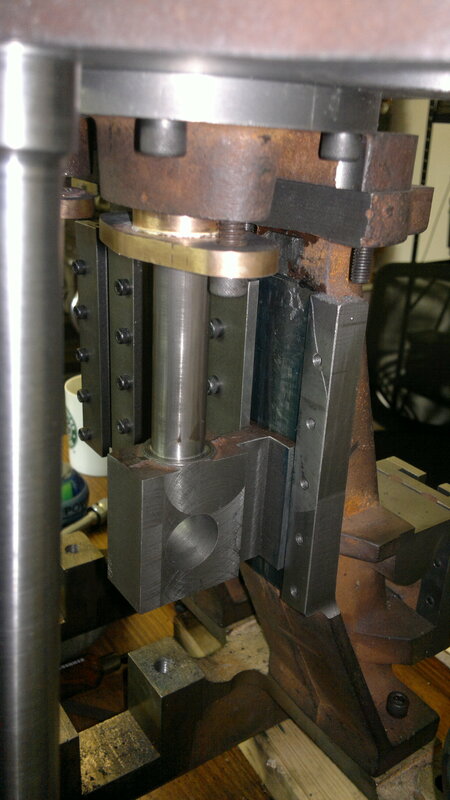 So, as the picture shows, you clamp the casting in the slot (and while this is still rough, I figured that it would mean that is was “straight enough”) – and then being held vertically the shaper can cut a nice square face. 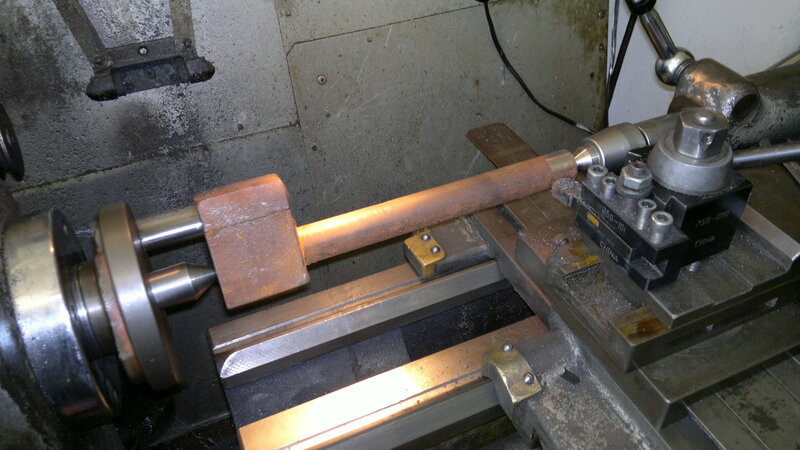 Then turn it over and do the other end, then mark out on surface plate, with height gauge; center pop, and center drill, and then it’s into the lathe between centres to turn the rod. As you can see I have been using cutting inserts – these really are amazing, especially if you remember to put the right insert in for the material you are using. I am told that you can now buy “universal” tips which will cut a very wide selection of materials, but I have not tried these yet. The turning went well, but I found that the rod was oversize by about 4 thou at the tail-stock end, and I concluded that this was actually play in the live centre I was using. So for the final cut I used a dead centre (and suds to help stop the heat of the cutting process from expanding the bar over, tightening the clearance with the centre, and producing yet more heat… friction…heat… and bad end!). 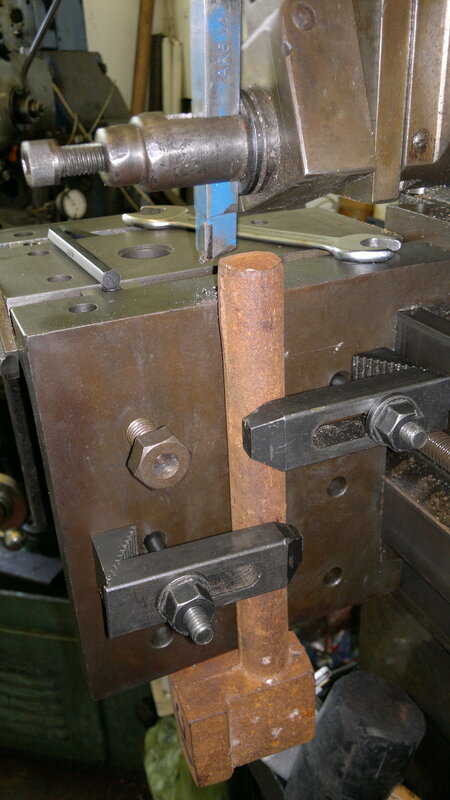 I also used a carbide tipped tool, sharpened on the Quorn cutter grinder to do the finishing cut – this is important because if you look at the data sheets on the Comorant cutting inserts you discover that in-order to maximise tool life, these are actually made blunt (to provide a more durable cutting edge) and will therefore require a minimum cut of about 6-8 thou. With all this attention to detail, the 65-year-old lathe did a great job, with under a thou of difference over the length – 20 minutes with some emery cloth, both produced a nice finish, and allowed me to hand finish to within about 3-tenths of a thou – very happy! 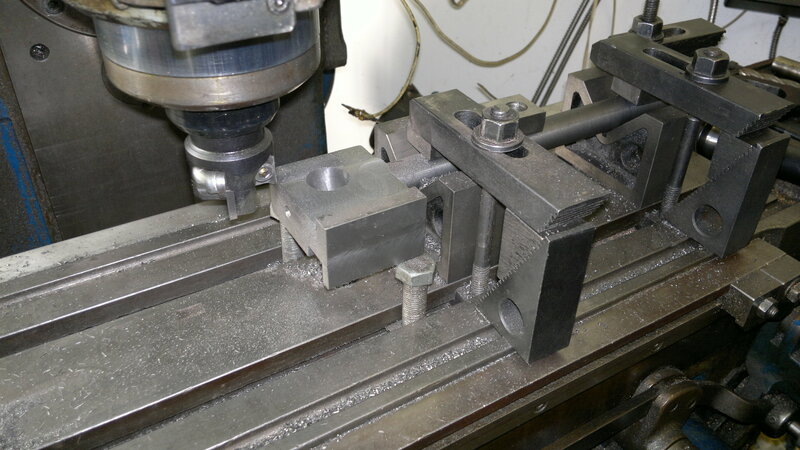 The the game was to hold the rod-part in v-blocks on the lathe bed, and true it up with dial gauges – then machine the rear (slideway) face first, then use this to get the other faces true. The final act being to rotate the piece so that the slipper face was against an angle plate (to ensure it was vertical) and with the rod holding the part truly horizontal and then bore the little-end bush hole with a boring head. Now all that was needed was to mate the cross head to the slideways. Aside from the nasty scratch shown in the picture (but fortunately obscured by the slideway cover that bolts on) this went OK. I had deliberately arranged to have a slight interference fit to start with, so I could scrape them to get a good fit. This was surprisingly hard to do. Because there are 7 sliding faces on the crosshead (left, right, back, front-left, front-right, and the left/right faces of the narrow part of the crosshead which “joins” it to the little end bearing block) it is actually tough to find what is “sticking”. But about 2 hrs per rod saw the job done. I was using the actual bearing and stuffing-box gland to hold the rod, and then slide it up and down to check for the fit. I have realized why we often call mechanics today “fitters” – because with technology and machining of this kind of age, the largest part of the job IS fitting bits together, to get a smoothly running joint/assembly/machine… I gave in a few weeks ago and purchased my own set of hand scrapers – and they have seen a lot of work since! This entry was posted in The Power Plant and tagged lathe, machining, piston, piston rods, scraping, shaper on November 13, 2012 by sybefur.